Before you build anything, you have to clear the site, and that’s what’s happening on land where developer Charles Weathers of Salem intends to build what he calls Hickory Hollow, the first apartment complex to be approved in North Albany. The parcel of little more than two acres used to have a stand of tall conifers — Douglas fir, I think — and now they are on the ground as logs. The property at 720 Hickory St. N.W. is sandwiched between rows of single-family houses on the north and south. It was zoned to allow apartments some years ago, part of the city’s plan for greater density and a mix of land uses in this part of North Albany, close to Highway 20 and North Albany Road. Neighbors opposed the site plan calling for four three-story buildings of 12 units each, but in July the Albany Planning Commission turned down their appeal. On Aug.14, the city issued permits for clearing the land and constructing the first of the buildings. The building permit lists Harvey Cain Construction Inc. as the contractor. The permit values the building at about $913,000. The city fees amounted to just over $5,000. Before: The site looked like this back in March. Yes people have to live somewhere. Sprawl can be slowed when apartment housing is four stories. In Russia and other countries, several story flats or apartments were traditional 50 years ago. As for farm families in Linn County, land use laws are so strict, you cannot build another home on your property, unless an old water well exists on said property. That is discrimination against another generation living on the farm. That is criminal because I remember each farm we own, having a house on it in the past. Yes, people need to live somewhere and who better than your own family. After having read that Albany population numbers are expected to soar for the foreseeable future, it strikes me that no new building in Albany should be taller than the Carousel. “Seeing the logged-over site on a hot summer’s day, it’s hard not to regret Albany’s annexation of North Albany in June 1991″….agreed HH. 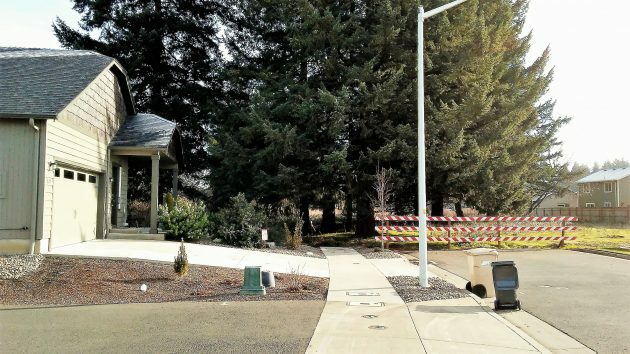 Sad to see Oregon’s beautiful trees cut down, replaced with concrete and asphalt. Everyone agrees that felling trees is a harbinger of more to come. Yet no one ever discusses the underlying challenge. Simply put, humans use too much of the available resource and human numbers are only growing. What the planet needs is far fewer Homo sapiens putting far less stress on the system. In the face of ever-expanding human overdevelopment, the outcome seems clear. Our fate will be far more severe than a few apartment buildings in North Albany. 1 – Cars as typically used today –> bicycles, walking, better car-sharing, better public transit where it works well, self-driving cars, congestion pricing. Will need significant government and/or corporate initiative. 2 – Big houses –> smaller houses. Will need significant, possibly “anti-American,” attitude adjustments. 3 – Single-family suburban sprawl –> denser pedestrian-and-transit-oriented development, and not just mediocre apartments like what’s probably coming to North Albany. Will need acceptance by NIMBYs and buyers who seem to be abundant in Portland but missing here. 4 – Energy management by smart meters. Will need rethinking of paranoid attitudes. Will also need sensitivity by government in dealing with those attitudes (more congestion pricing, less govt. control). We seem to have elected a President opposed to all the above (and effective worldwide family planning as well). Based on many of his previous comments, I suspect John Hartman might rather rub our faces in the problem than seek solutions, a point of view which I appreciate. I used to pray for $20/gallon gasoline, and probably will again if America gets too “Great Again” (slim chance). You want a proposal? Mandatory one-child-only policy just like China used to have…only worldwide. We may need more efficient housing, vehicles, metering and all that other stuff, but until humans figure out that we are the problem…our sheer numbing numbers are the problem, all the efficiencies in the world will only buy a little time. Exactly! People are the problem, not the solution. Believe it or not, I agree with you except for some implementation details. I have to give kudos to those that were forward thinking enough to purchase the Thornton lake land, they took a lot of heat for that decision, but they were right. 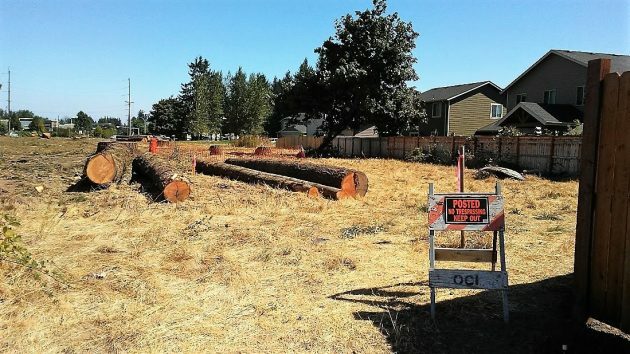 Just drive by the Hickory apartment site and look at the absolute destruction of anything Oregon, every old growth tree was destroyed, nothing saved, it will make you sick to your stomach. It is interesting how so many decry the expansion of urban housing when that was the explicit purpose of restricting such growth into urbanized areas, and not in areas reserved as farm and forest land. That land is still there – it’s just not in your back yard. If you voted for extended land use planning and regulation, with such decisions left up (in large measure) to government bodies, then you are getting exactly what you asked for. As a former NYC mayor said after one election, “The people have spoken, and it is only right they get exactly what they chose, good and hard”. I’m sure you’re correct; and Ed Koch no doubt botched it up. Much like what he and all the other “Progressive/Democrats” did to NYC over the years. Humorous chit chat hear in the comment section Hasso! I prefer before/after photos to be taken from the very same orientation. Your example…look at the before first, then the after and I gasp! Where in the world did the house on the left go?! Puff…gone? John Hartman’s proposal may be on the right track except for the “mandatory” requirement. We already have enough of those. Instead, why don’t we review our endless “humanitarian” efforts to help the third world with their monstrous birth rates and provide it instead with incentives for birth control? One-Child rule would NOT be just for Third World countries, but for ALL world citizens. Several Western belief systems encourage multiple births. These must be curbed as well if the world’s population is to shrink. One-child rule for about 5-generations ought to bring the numbers of polluting humans into line with what the planetncannsafely absorb.